Nothing in the news or charts suggests that the projections are way out of line. Of course, gold will not go straight up to those levels, there will be reversals along the way, but that's what it looks like from the P&F chart point of view. From the normal charts and indicators things look good also. 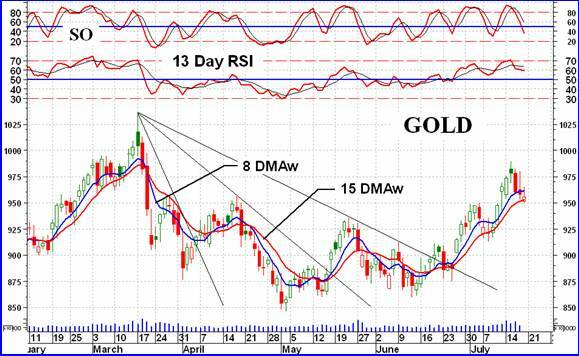 Using the daily chart indicators, gold is above its long term moving average line and the line slope is upwards. The long term momentum indicator remains in its positive zone, where it has been for years, and continues above its positive trigger line. The volume indicator is again at new all time highs and remains above its positive trigger line. From these indicators the only rating I can give the long term is a BULLISH rating. The picture on the intermediate term, although quite positive, is not as clear as the long term. We see the upside break-out through the resistance level but the break was not all that strong. There is a resistance in the $960 to $990 level from the early March action that seems to be causing the move some problem. Maybe a little rest will do it but that remains to be seen. 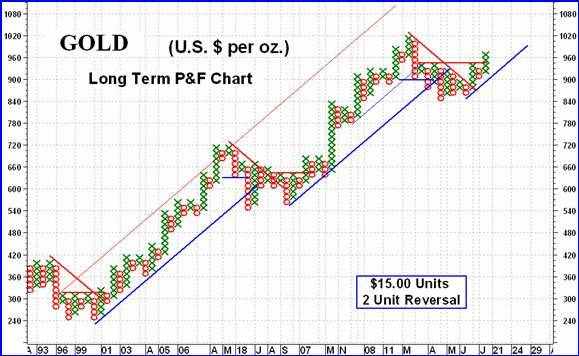 The price of gold is above its positive moving average line and as long as it stays that way there is no real worry. The momentum indicator is confirming the price move but is not showing any extra strength behind the move. A strong move should have seen the indicator at least above the 60% level. The indicator has dropped below its trigger line but the trigger is still pointing slightly upwards. The volume indicator is still the strongest indicator and is above its positive trigger line. Despite the slight weakness in the momentum indicator I must still rate the intermediate term as BULLISH . Maybe there will be a change next week but let's wait for it, it may not come. Since turning up in mid-June, and especially since the very short term moving average line (8 DMAW) crossed to the up side, the short term moving average line (15 DMAW) has kept you positive, short term wise. Now, one might wonder if the short term upside move may be ending. It is starting to look iffy but all is not yet lost. Gold is sitting on top of its positive sloping moving average line and the momentum indicator is still in its positive zone. Momentum, however, is heading lower and is below its trigger line although the trigger is still slightly positive. The daily volume action has been improving on the up side and diminishing on the down side. 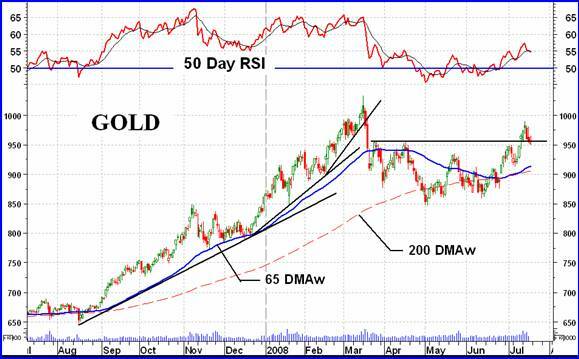 Since reversing from its overbought zone a few days back gold has been moving lower but not at any desperation rate. For now the short term is still rated as BULLISH but that may change with a couple of more negative days. The immediate term direction of the action looks to be to the down side. Gold is already below its very short term moving average line although the line remains just slightly positive. The more aggressive Stochastic Oscillator (SO) is moving lower and is in its negative zone below its negative trigger line. The direction of motion is to the down side and that is the immediate term direction, until verified otherwise. I am not an Elliott Wave person and confess not to understand the technique (although I did have to study it many, many years ago). It just looks like too much work for a lazy guy. However, for you Elliott Wave people out there, looking at the action since mid-June, have we completed a short term bull move and are into a bear phase? Or looking at the action since late April-early May, are we only at the second of the three up legs of a bull move? Youth wants to know. I much prefer my FAN Principle, when I have it. The Bullish Decelerating Fan confirmed a reversal in mid-June. I call it a Bullish Decelerating Fan because its completion and confirmation leads to a bull move and from Fan one to Fan two to Fan three the negative move is getting weaker and weaker (decelerating) from a common apex point. 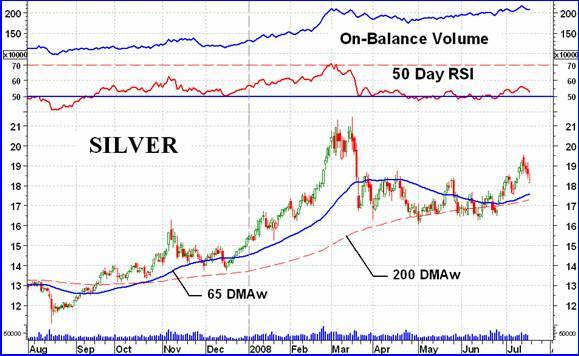 As the chart of silver shows, there is really very little difference between the recent action in silver and that of gold. The major difference, as I see it, is that the actions of the momentum and volume indicators are weaker here than for gold, even though gold momentum was not all that great. One can just read the gold review and apply it to silver for now. Catching up will continue next week with a more detailed look at the stock Indices. The fact is without raising taxes and rebuilding a serious manufactoring base here and stop outsorceing, even super interest rate rises will not protect the dollar in the 3-5 year term. without growth foreign investors will not keep investing in our economy. we are in such a crises right now the fed would risk a collapse in the economy just to try and save the dollar in the short run by boosting rates to levels needed.in the short run they have a currency to go to but soon europe will feel effects , but not nearly as bad as the us. the middle class is the only people who know what is really going on. there is alot of forclosures coming, i am going to be walking away from my second house, i bought it for 30k and borrowed at 318k and it does me no good to keep it, i bought gold and silver with the extra money and dont need credit anymore since my primary house is paid off and my gold is worth 2x what i paid. if the public gets smart (by that time gold will have reached 1600) they will eventually start beliving and thats when ill sell some.never fear a super drop in gold like the stock market, gold cannot go to zero and stocks can.